Mr Grey was born from the idea of creating the ultimate escape vehicle. 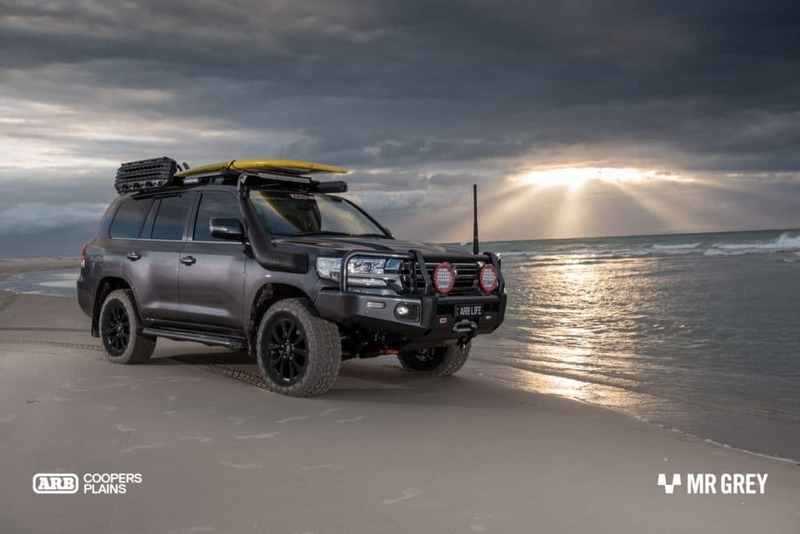 Spurred on by the imagination of Company Director Mark Lacey, this Toyota Landcruiser 200 Series VX was brought to life by the team at ARB Coopers Plains. 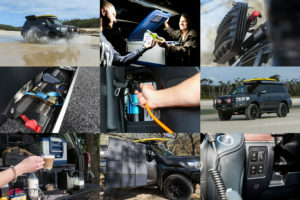 After confiding in many top representatives from the likes of Redarc, GME, Rhino Rack, Revolution Power Australia, Old Man Emu and ARB, plans were drawn up to create something unique and special. Lifestyle was the crux of this build. Everything from the battery system through to the lighting has been designed to be extremely user friendly and simple. While the outside presents a showroom style finish, neatly hidden underneath is a complex system of moving parts and electrical equipment with the ability to run anything from air tools to Nespresso coffee machines. 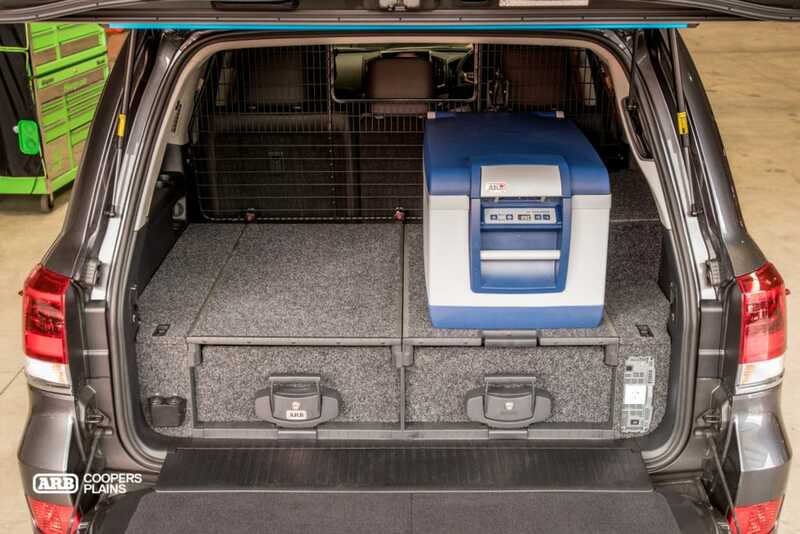 Escaping for the weekend or even a month is made easy with the “Lifestyle Energy System”. This complex yet simple to operate system consists of only the best components from Revolution, C-Tek and Redarc. 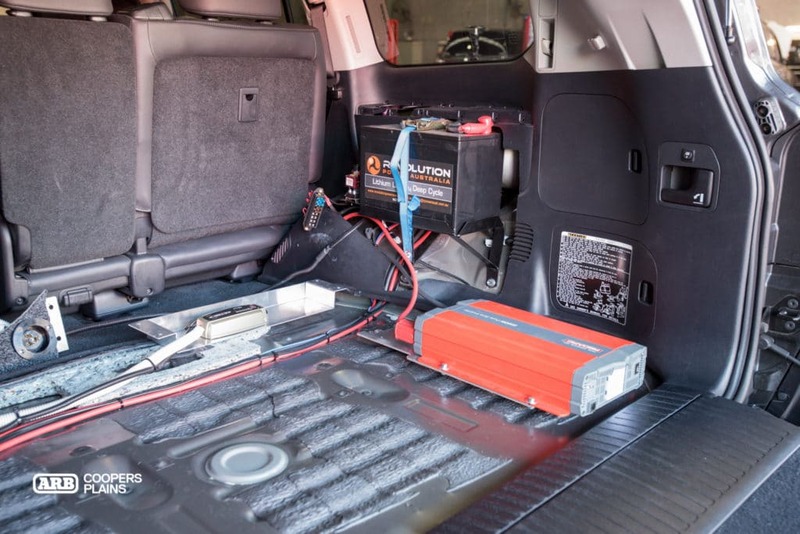 The Redarc BMS (Battery Management System) controls the two 100 amp hour Revolution Lithium batteries tucked into the cargo area. 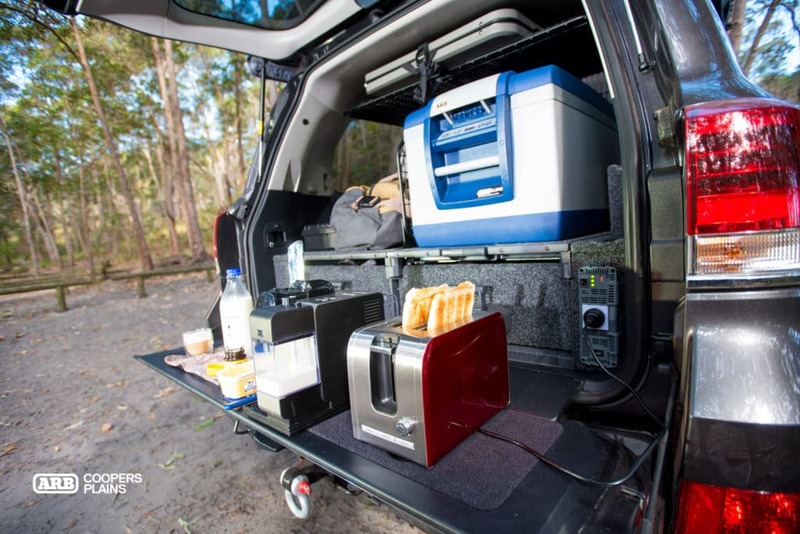 The Redarc 2000W inverter is on standby if you are in dire need of a coffee and toast. 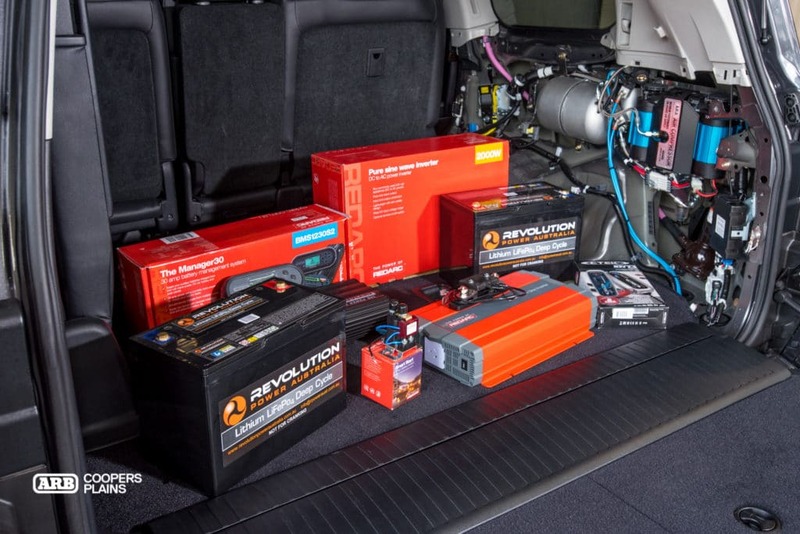 Grunt can be supplied by the alternator, the solar blanket or plugged into the grid. 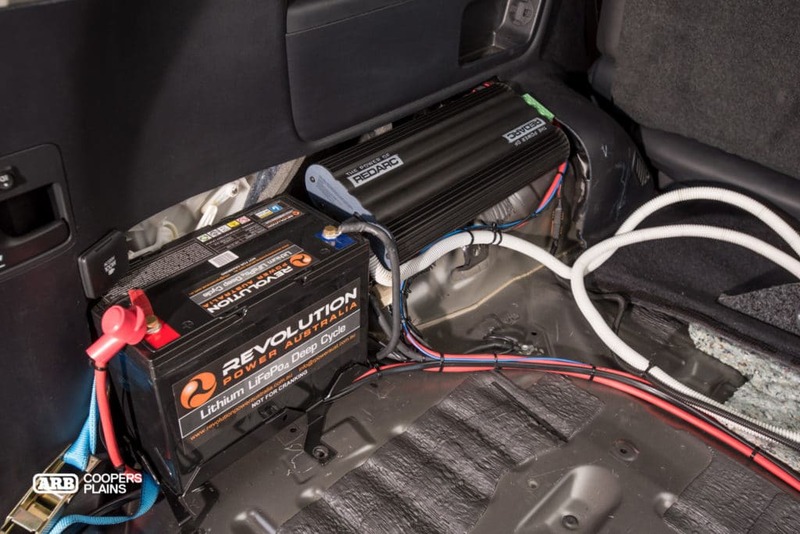 The Lithium system was selected due to its light weight, deeper discharge depth, faster recharge capabilities and flatter power delivery than that of a traditional an AGM battery system. 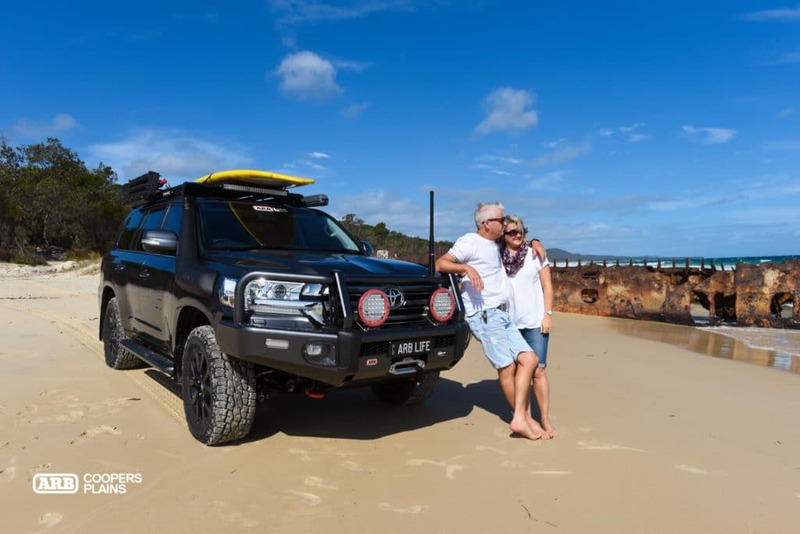 The Beasty ARB Twin Compressor, 4L Air Tank and Diff Lock Solenoids have been tucked into the rear quarter panel utilising a laser cut Stainless Steel bracket that was engineered to bolt into the factory Toyota holes. The entire system is so neatly packed away behind the original plastic trim that it even allows you to maintain the 3rd row seats to complete the school run if need be. 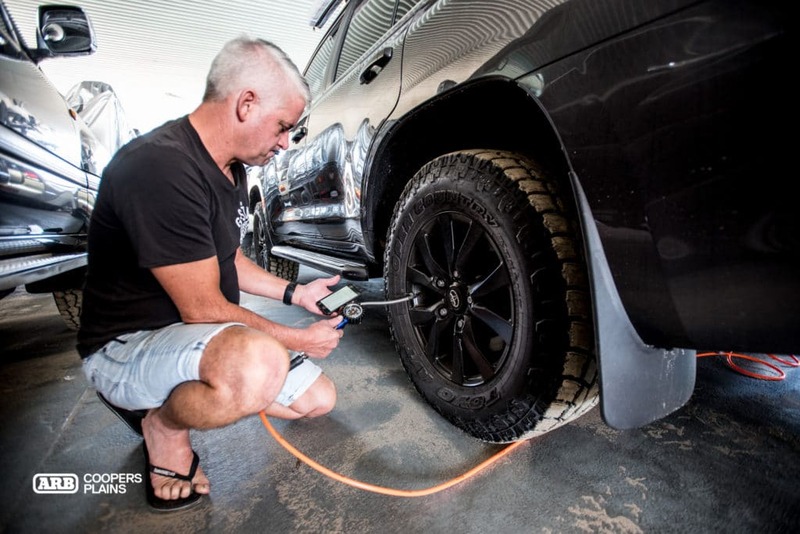 The air system will allow you to blow the sand out of your fishing reel, and will inflate a 285/65R18 (33”) Off Road tyre from 20psi up to 40psi in just over 60 seconds. 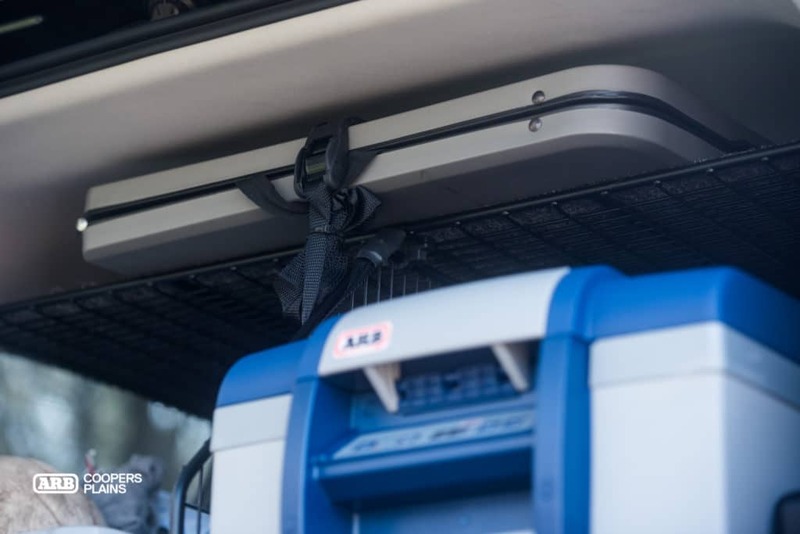 All of this is hidden behind the ARB Outback Roller Drawer System, complete with the cargo barrier, rack and divider to make life a little more organised. 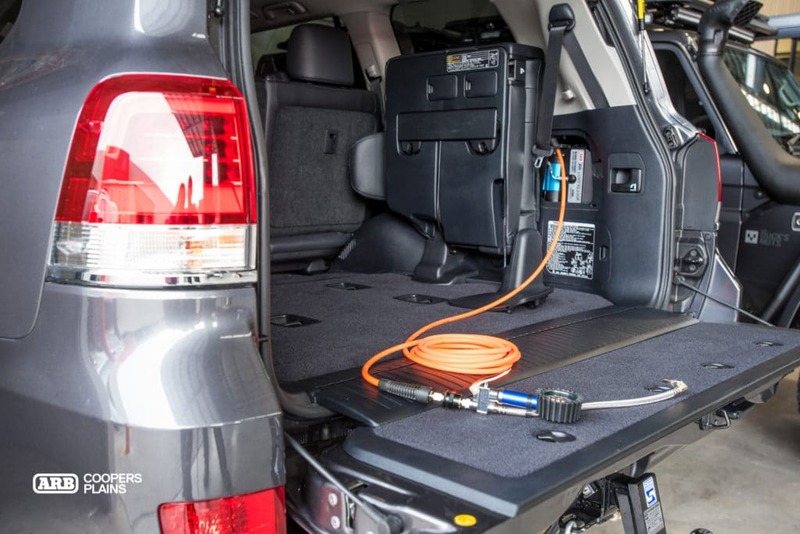 The upper rack allows for the storage and quick deployment of the camp table. Moving to the exterior of the vehicle the eyesight is drawn directly to the ARB Summit Bar on the front. Protection for your family is taken care of in a stylish and practical way that compliments the lines of the 200 Series. 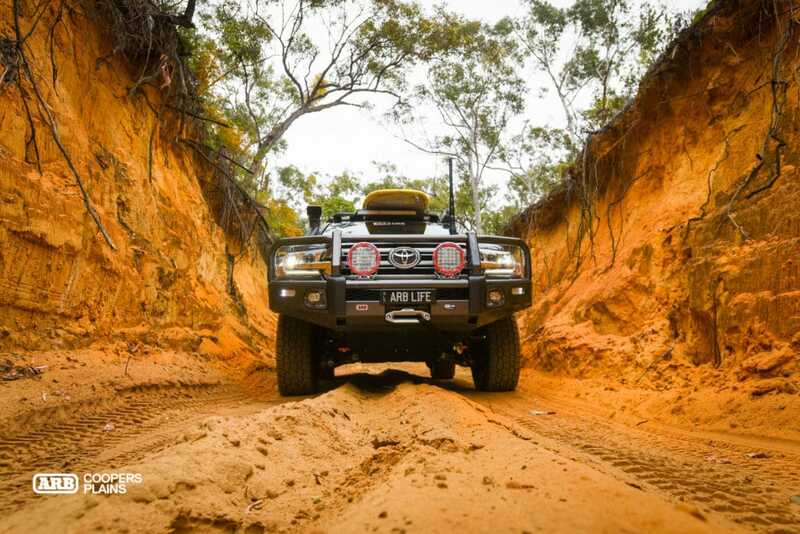 Warn’s Zeon Platinum winch sits behind it begging to be used on the next hill climb. With a 10,000lb capacity and super quick line speed, this IP67 rated winch is Warn’s premier product. The ARB LED Intensity’s sit conspicuously on the front of the vehicle, carving a path through the darkness on those late nights into camp. 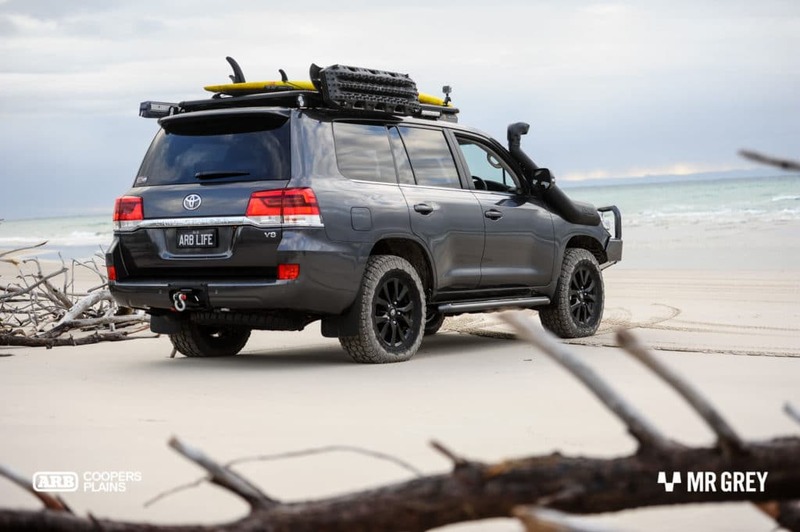 Rated recovery points have also been fitted for when the big Toyota comes across another vehicle in distress. 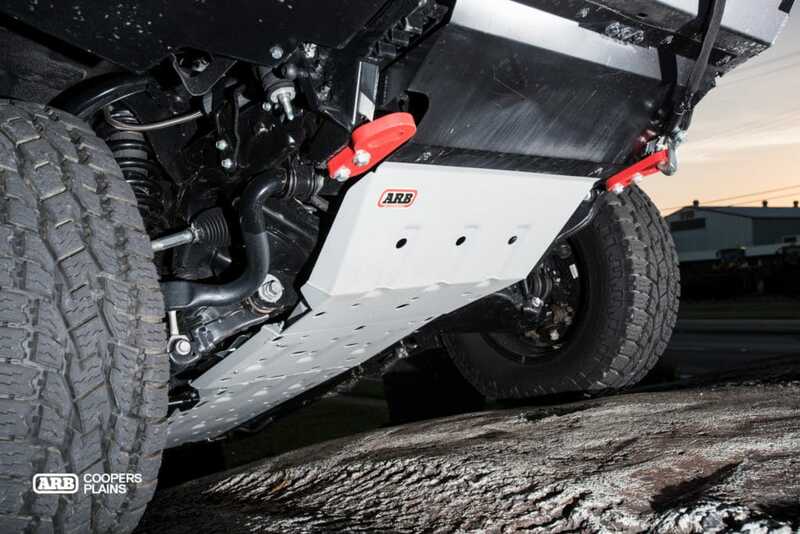 Fabricated from 3mm laser cut steel, ARB’s Under Vehicle Protection provides increased protection for Mr Grey’s under body components from the rocks and ruts encountered on the trails. 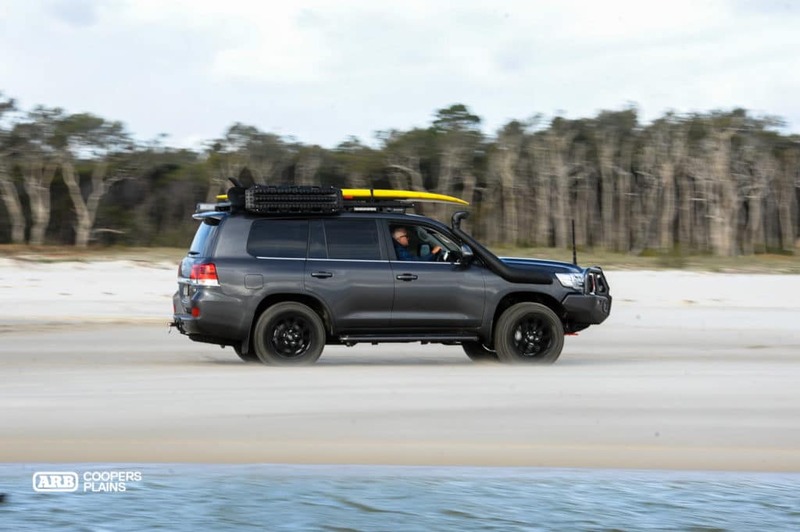 Side protection is delivered by ARB’s Summit Side Steps, finished off with a black powder coated tread plate to complete the darker shade of styling. 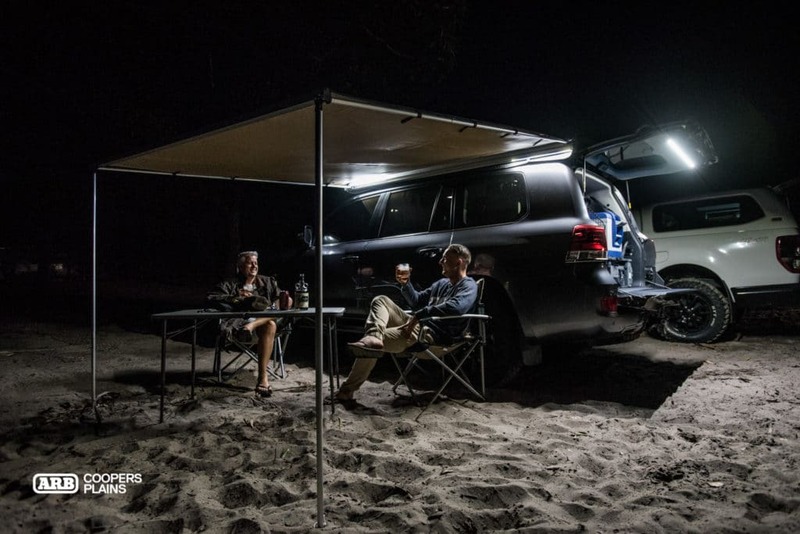 Once Mark and his family have pulled into camp they can open up the vehicle and deploy the awning, revealing LED lights for every angle. A tailgate light, rear work light and front/side LED light bars take the frustration out of late night camp set ups. The durable Rhino Backbone System allows for so many different options to be fitted including Maxtrax, awnings, shovels and high lift jacks as well as tie down points for those bulky items like swags and gazebos. 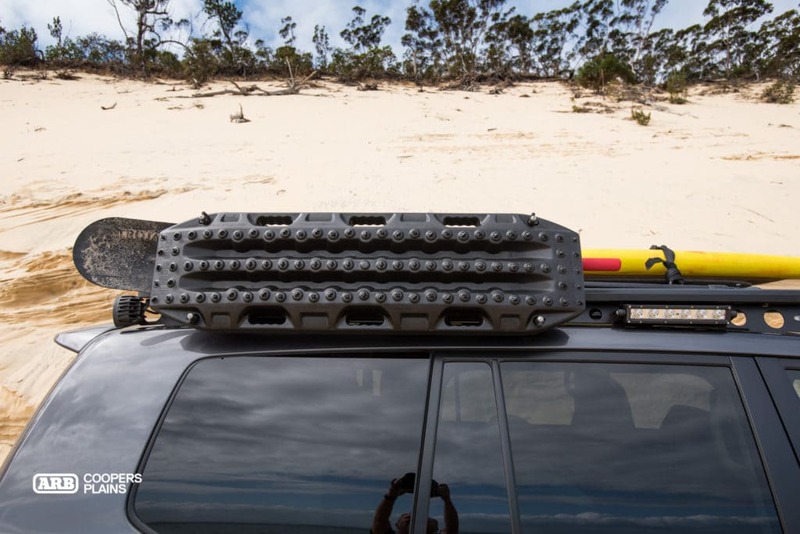 Secure and even weight distribution is the key for this style of roof rack. The big V8 will take as much clean air as you can give it, so naturally a Safari ARMAX snorkel had to be fitted. 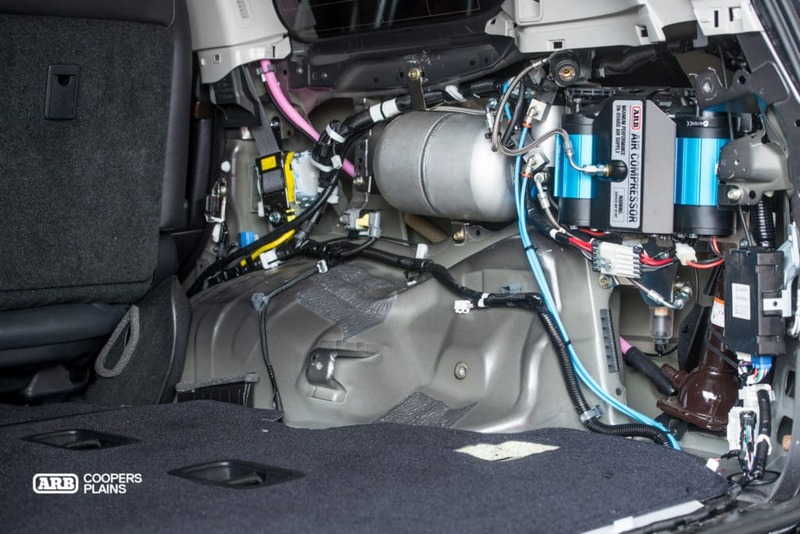 By raising the intake to the windscreen level you allow for more power, cleaner air and improved fuel economy. Letting the beast breathe during river crossings is no longer an issue. Rather than investing in aftermarket wheels, Mark has powder coated the factory alloys for a more fashionable effect. Toyo Open Country AT2’s have been fitted to the rim to gain more traction, especially when engaging the ARB Air Lockers. 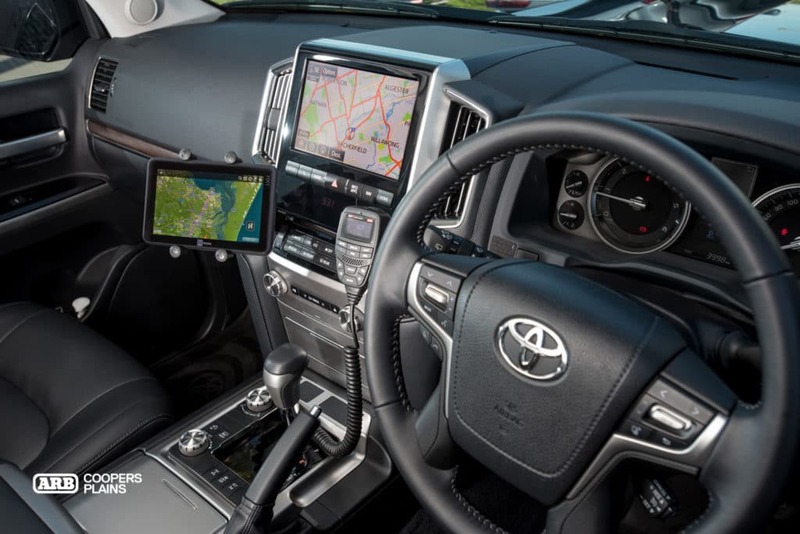 In the cockpit the HEMA HX-1 Navigator provides the navigation, containing detailed offroad maps with points of interest and taking over the everyday street navigation as well. This is a must have for any avid offroader. Communications are looked after by GME’s new XRS radio. These radios are able to be programmed through your smart phone with the XRS application. 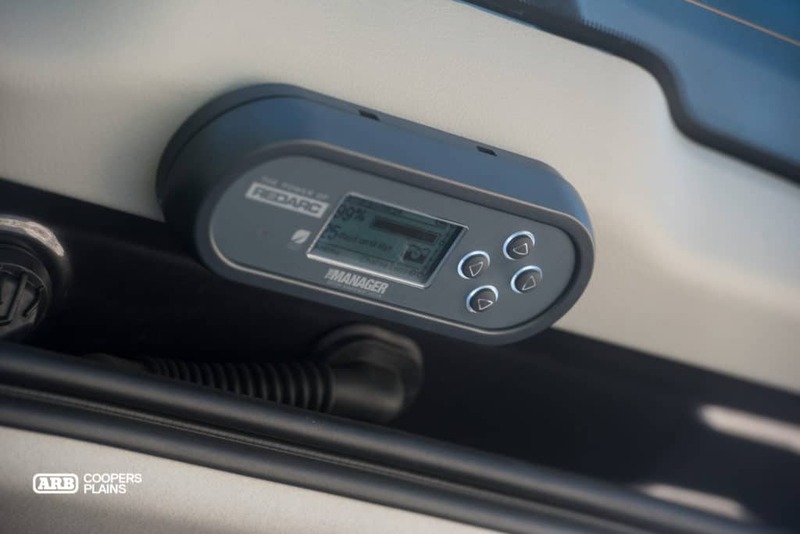 Featuring all controls and the speaker/mic on the handpiece, the brains of the unit can be mounted almost anywhere out of the way. The OME BP-51 Suspension takes the 200 to a whole new level when it comes to ride control. With the ability to adjust compression and rebound with the turn of a spanner, this innovative suspension system allows you to customize the ride to your preference. You may need to enlist in the services of a navigator as corners will start appearing quicker than usual. If you would like to discuss these options and more, please call an ARB Coopers Plains Team Member on (07) 3277 2020. To check out the extended Mr Grey photo gallery, click here.